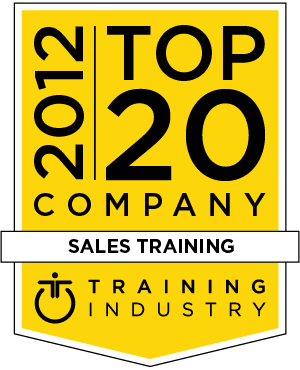 The Top 20 list recognizes the top sales training companies in our industry. These leading companies all provide outstanding service, and a proven track record for delivering superior sales training and improving the impact of the sales organization. Request RFP/RFQ advice or referrals: Contact us. Due to the diversity of services included in sales training programs, no attempt is made to rank the Top 20. GP Strategies is a global performance improvement company. From sales and management training to consulting, incentive programs and customer loyalty, GP Strategies' end-to-end, customized sales solutions are designed to enable client-facing, revenue-generating employees to have more relevant and effective conversations with customers and buyers. Miller Heiman Group, the largest dedicated workforce performance improvement company in the world, helps companies and their business leaders around the world build and sustain customer-focused, high-performance organizations to drive profitable revenue and predictable top-line growth. The Brooks Group is a corporate sales training and sales management training company focused on helping companies build top-performing sales teams. Their training systems provide street smart, actionable strategies that help salespeople sell more effectively and help sales managers coach and lead more successfully. Imparta is a global company that generates measurable and sustainable performance improvement across sales, marketing and service - the main customer touch points within an organization. In each of these three areas, Imparta offers a full suite of content and methodologies. Acclivus R3 Solutions is an international professional development firm that helps corporations improve the performance of their sales, support and service professionals. They help sales, support and service professionals develop proficiency in communication, negotiation, problem-solving and strategic planning. FranklinCovey Co. is a consulting and training leader in the areas of strategy execution, leadership, customer loyalty, sales performance, school transformation and individual effectiveness. They empower sales leaders to evolve sales teams personally and professionally to enhance performance, achieve sustainable results and gain a competitive advantage. Sandler’s training methodologies, reinforced through coaching and 24/7 online training and accountability, help sales professionals and management executives fulfill personal and organizational goals by initiating sustainable growth, increasing bottom line results and maximizing sales ROI. BayGroup International, now Red Bear Negotiation Co., is a global performance improvement firm that helps corporate leaders achieve critical profit improvement cost containment and team effectiveness goals quickly and with high impact. Mercuri International is a global organization that is comprised of over 300 full-time highly experienced sales and leadership professionals in over 40 countries that have helped over 15,000 companies worldwide optimize their sales results. Methodologies are supported through continuous development and refinement in St. Gallens University. The Sales Board has trained and certified over 400,000 salespeople in the selling skills of Action Selling. Action Selling is a full-scale, proactive, communication process for planning, conducting and following up on a sale. It treats the buyer with respect, leading to lasting relationships and repeat business. Sales Performance International uses SPO, a next generation, data-driven approach to rapidly align a client's sales abilities with their company’s specific business goals. Using advanced analytics, an extensive sales competency model, learning library and visual playbooks, SPO gets a client’s sales organization focused on the highest payback capabilities. Executive Conversation works with sales and marketing organizations to build business acumen for effectively engaging and selling to customer executives. The product of merging AchieveGlobal and The Forum Corporation, AchieveForum’s legacy includes hundreds of clients across more than 50 countries and the capabilities to address the most pressing leadership development challenges. AchieveForum partners with clients to design and execute leadership development solutions that drive business results. Wilson Learning is a global leader in leadership development, sales development, workforce development and performance improvement solutions. Wilson works with clients to understand their specific sales issues, organization, offerings and customers in order to develop the right approach. CustomerCentric Selling® has been delivering sales training around the globe since 2002. Drawing upon its CustomerCentric Selling® (CCS®) methodology, the company's workshops and specialized training equips sales organizations around the world with the sales processes and selling skills necessary to win in a highly competitive marketplace. Performance Methods, Inc. (PMI) is the leading provider of customized sales best practices solutions. Based in Atlanta, PMI provides consulting and training services to assist clients in the design, development and deployment of customer engagement best practices. Altify provides an enterprise sales methodology in software. The Altify platform helps sales teams with the deals that matter and increase wallet share in existing customers. With 30+ years of sales knowledge, the Altify platform is the catalyst to helping sales, their managers and executives maximize sales results with insights and coaching. Richardson is an internationally recognized sales training and sales performance improvement company. Richardson seeks to partner with clients to develop continuous learning solutions that help change behaviors and enhance the effectiveness of their sales organization. ValueSelling Associates equips professionals in all sales roles to compete on value, not price, using a time-tested methodology with decades of proven results. Delivery options include blended learning, on-demand courses, video reinforcement and live instructor-led programs on nearly every continent and in over 12 languages. As part of its commitment to continuously monitor the training marketplace for the best providers and services TrainingIndustry.com has released the Sales Training Companies Watch List. Due to the diversity of services included in sales training programs, no attempt is made to rank the Watch List. "Sales Readiness Group’s (SRG) singular focus is helping sales organizations improve sales performance through industry leading sales training, sales coaching and sales management programs. STR combines in-house expertise in sales and sales management best practice, instructional and creative design expertise, and technology and broadcast media to make sales performance programs engaging and motivational for the salesforce. Integrity Solutions helps organizations align attitudes and beliefs around a customer-focused strategy to increase sales, strengthen customer relationships, maximize productivity and retain talent. They partner with clients to establish a needs-focused, ethics-driven differentiator in the marketplace, creating a client-relationship-building advantage. Centum Learning’s solutions cover the entire spectrum ranging from learning process outsourcing, custom content development, training through blended learning programs, executive coaching and performance coaching to process management and certification. Janek Performance Group provides comprehensive and innovative sales performance solutions at every level of your sales organization, offering coaching for sales reps, sales managers, sales coaches and company executives. Porter Henry & Co, Inc.
Porter Henry & Co. offers consultative selling programs to develop sales skills, selling workshops, and dynamic workshops to boosts sales managers’ and leaders’ performance. Porter Henry has a can facilitate the workshops with their professional trainers, or conduct train-the-trainer sessions. Dale Carnegie Training® has in-person and live online courses that improve the performance of employees with an emphasis on leadership, sales, workplace engagement, communication and other essential business skills. Intrepid Learning, Inc.’s learning platform empowers organizations to solve critical business challenges with a nimble, elegant, engaging cloud-based learning technology that scales massively, connects learning to everyday work, and provides an integrated social and mobile-first experience. AXIOM is providing a solution that replaces traditional sales training events and tools with a solution that drives continuous learning in the normal cadence of your business. Axiom clients build relationships and win business while simultaneously developing their skill and knowledge. Baker Communications has experience in sales, marketing, channels and CRM optimization. Baker Communications can improve employee productivity, increase sales and management effectiveness, and to help you increase profitability while reducing costs. Cegos is an international leader in training and development who believes that by developing employees’ success, the company itself will succeed. They offer a variety of training solutions such as e-learning consultancy and strategy, tailored and multi-device e-learning solutions, and blended learning. BTS has been offering training for the past 30 years. They work with sales training partners to co-create the most relevant experiences for their salespeople, managers and leaders. BTS can deliver training in a variety of formats, including classroom, blended learning, e-learning, train-the-trainer, and through web and mobile platforms. Corporate Visions is a leading marketing and sales messaging, content and training company. They deploy tools aligned to the buying cycle and sales process and empower clients to accelerate deals through the pipeline. They deliver skills training that teaches the science and art of telling a story with impact, clarity and differentiation for every interaction. Tricore, now Guidemark Health, is a leading innovator and developer of training strategies, curriculum design, and training program development. Tricore develops online, print-based and workshop (facilitator-led) training programs using a host of solutions including e-learning, rapid-learning tools, mobile learning and gaming platforms. Advantage Performance Group is a professional services firm dedicated to providing a continuous stream of creative learning and consulting solutions that equip individuals, teams and organizations to be the best at what they do.